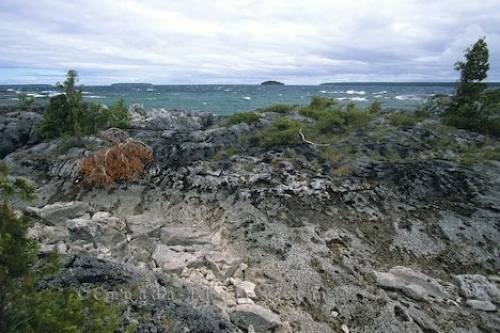 The landscape along the coastline of the Bruce Peninsula near the town of Tobermory, Ontario in Canada is made up of a mixture of different textures. From the cliffs you get a magnificent view of the ocean as the whitecaps stir on the waters surface as it becomes rough. Tobermory on the Bruce Peninsula, Fathom Five National Park, Ontario, Canada, North America. Picture of the mixture of vegetation along the banks of the town of Tobermory, Ontario overlooking the rough ocean waters.